After averaging 102 in his last six games and averaging 111 in 2015, surely Luke Hodge is a ‘lock’ as a defender priced at an average of just 87? Join Calvin as he takes a look. Firstly, happy New Year’s Eve. It’s one of the greatest days on the calendar and therefore I thought we’d need to cover once of the nicest/best blokes in the game. 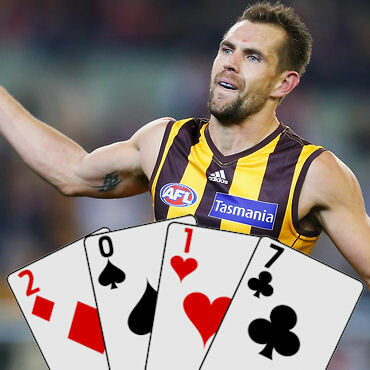 Luke Hodge. Now, those anti-Hawks people out there…. Relax. Hodgey is a true jet and here at DT Talk, he has been of the best blokes to us over our time and his dreamy eyes get you at ‘hello’. Why should you pick him? He’s a defender, and Luke Hodge will be one of the best defenders you’ll have in your team by the end of the year. So why not start with him at a bargain price? He set the Fantasy world on fire in 2015, averaging a massive 111. Now, I’ll be the first to admit he won’t do that again… but what if he can get close? What if he can average high 90’s or even, low 100’s. He is certainly capable doing this, like he did in 2015 and like he did in the 2016 AFL Finals where he scored 104 and 114. In fact, he averaged 102 in his last six games of the season. With Sam Mitchell and Jordan Lewis departing, I can only see this benefiting Hodgey. Yes, Jaeger and Tom have arrived, but they are kids. Mitchell and Lewis demanded the ball and the midfield time they deserved. Hodgey will need to help out more than ever. He’ll need to have stints in the midfield as the bigger-bodied, experienced player. As well as, floating across half-back demanding the ball at every opportunity. The fact it, if Hodgey is open, Jaeger and Tom are finding him. Age. Durability. The two main reasons why people will avoid Hodgey this year, and they are both very valid. Despite having skin like a model, Hodgey will turn 33 this year. This crosses him off the list of many experienced coaches. A role change down back will lengthy Hodgey’s career though and as we know, there are a lot of points to be had in that back half. He only managed 13 games last year, but with that said, he did play all games from round 14 onwards. The big one though is… he hasn’t played a full season since 2007 and over the last five years, he has only played in 67% of home and away games. That’s why he isn’t a ‘set and forget’ defender in your team. He won’t play all 22 games this year and he will cause you unwanted stress every Thursday night. KING– I’d love to say ACE (as he has averaged 111 before) but the man can wear a crown. He could potentially be a king in your defence and with so many great options down back this year, our strategy will need to be reassessed compared to what many coaches rolled with last year. Cheap defenders were the play by many coaches like myself but now we have Taylor Adams, Montagna, Docherty, Simpson, Shaw, Laird, Boyd and Johannisen who all have the ability to average 100+ and maybe even our very own, Luke Hodge. Will the trades of O’Meara/T.Mitchell IN and S.Mitchell/Lewis OUT benefit Luke Hodge? There is something about the way write your articles that is distinctly you. After reading the opening few lines I found myself reading it in your voice and yet I had seen nothing yet as to who had written the article. I’ll be starting with him because him missing games won’t matter with 44 trades in AFL Fantasy. He won’t get a go in the limited trades formats for me adn neither will Taylor Adams. Really? Do people still waste their time and energy making these comments? Even though Hodge eats pressure for breakfast, I think he’ll have his hands full without his comrades Mitchell and Lewis to lean on in 2017. The chances of him giving you a full season is slim. With a high number of coaches starting with Taylor Adams who likes to miss games also, it’ll be hard to have both in your back six. There are 36 trades with an extra trade before both the big bye rounds. So tempting… But I’m trying to value durability more than ever this season. On the Watchlist but I’m leaning away from this aging injury magnet for now. So, The Traders, what do you think? Do you think one can afford *not* owning the best player in 2016? – Patrick Dangerfield?